It’s taken years of plotting and planting, but Cotton of Carolinas is finally reaping the fruits of its labor: T-shirts spun with North Carolina’s first-ever commercially grown certified-organic cotton. Founded in 2006 by Eric Henry, president of TS Designs, the group unites farmers and manufacturers dedicated to keeping the entire “dirt to shirt” supply chain within the confines of the Carolina states. To celebrate, TS Designs has created a limited-edition “Homegrown” tee, designed by Graphic Collective, from the inaugural harvest. Bonus: A portion of the proceeds will go to the Carolina Farm Stewardship Association, an organization that promotes sustainable farming in North Carolina. But homegrown organic cotton isn’t the only way TS Designs is approaching sustainability. The apparel company also created a screen-printing technique, known as “Rehance,” that uses water-based inks in lieu of PVC-laced plastisol, which emits highly toxic dioxins during its manufacture and disposal. TS Designs also created a screen-printing technique that uses water-based inks in lieu of PVC-laced plastisol. 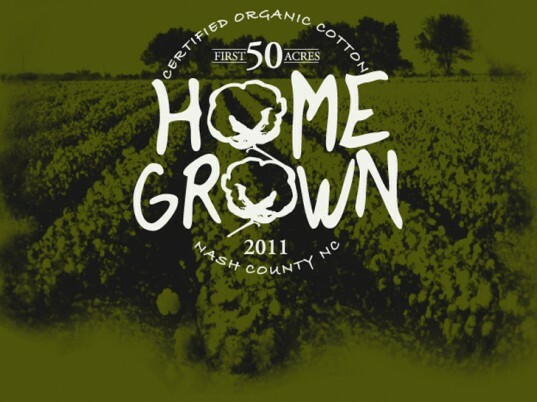 The first batch of tees, which Henry bills as the “most sustainable printed cotton T-shirts” on the market, will also include tracking numbers that unlock information about the farmers and manufacturers—along with their contact information—on the Cotton of the Carolinas website. “You basically have full transparency of each of the steps along the way,” he added. Despite the success of its first 50 acres, Cotton of the Carolinas isn’t about to rest on its laurels. The organization is working with Southern farms to grow agricultural products that can be turned into natural dyes. “Our dyes right now…are pretty much coming from the Far East,” Henry admitted. Cotton of the Carolinas plans to introduce natural dyes in 2013, however, even if it’s just one color in the beginning. Ecouterre , thanks for the post and sharing our story about our journey to make the most sustainable t-shirts. The limited edition t-shirts closed out last Saturday, but stay tuned for our next print we are going to do on our NC organic cotton t-shirts.